From Emmett, you will ride through Parma, a small agricultural town named after the Italian city of Parma by Albert Fouch in the 1880’s. We will be having a rest stop/photo opportunity at the Old Fort Boise, a trading post of the Hudson’s Bay Company built in 1834 to serve the fur trading industry. The post evolved to resupplying travelers heading West. Nowadays, the site is listed on the National Register of Historic Places and is found inside the Fort Boise Wildlife Management Area. 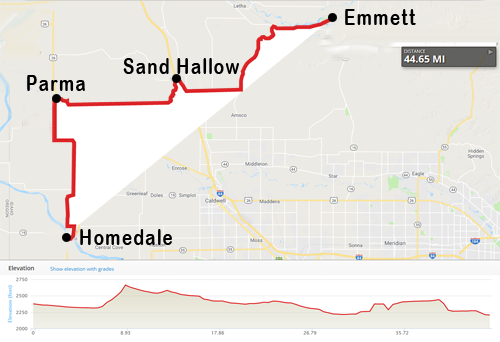 Our overnight destination for day four is Homedale, the largest town seated in Owyhee County. “Jacob Mussell was the first known permanent settler in the area when, in 1898, he built a ferry boat to help people cross the Snake River. It was just 11 years later when the townsite was platted, a mayor and council were put into place, and a town name was selected by drawing names from a hat.”(City of Homedale) Homedale was officially established in 1920. Immigrants from Austria and the Basque country in Spain contributed to the history of the town and still comprise the community today. Homedale was now established, complete with a newly constructed schoolhouse. Soon after, the Union Pacific Railroad built a line connecting Homedale to Nyssa, Oregon. The railroad, coupled with irrigation, helped turn Homedale and Owyhee County into a productive farming region. Currently, Homedale produces alfalfa seed, sugar beets, potatoes, corn and grain. 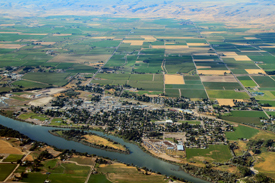 The area on the other side of the Snake River also produces hops and a bounty of wine grapes. The first hops were planted in 1934. In recent years, the hop industry has been fast-growing with several hop farms in Homedale and the surrounding areas expanding their acreages each year. The demand for a variety of aromas has been attracting many craft brewers to the area and just recently, Idaho became the second largest hop producing state, producing 13.7 million pounds of hops in 2017. We will be camping at Homedale’s Riverside Park. 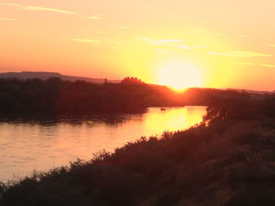 The park boasts a beautiful grassy area located right on the Snake River, the largest tributary of the Columbia River. Do not book a room at the Sunnydale Motel in Homedale, it very undesirable. This is the closest motel from camp, 16 miles away. We are still working on van transportation but Uber is available. This motel will also be the recommended motel for day 5, if you book for the two nights you wouldn’t have to move out.